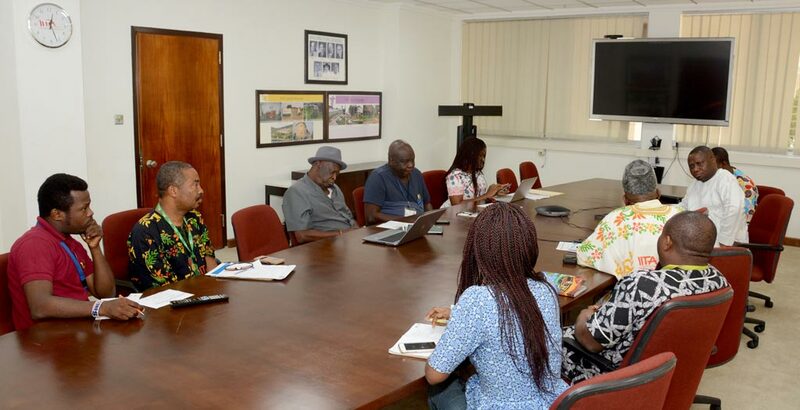 A delegation from Atisbo/Saki-West of East Federal Constituency, Oyo, visited IITA on 9 February to seek collaboration and technical support. The team led by Hon. Olajide Olatunbosun was received by the Director of Development and Delivery, and Project Leader, Cassava Weed Management Project, Alfred Dixon. The Hon. Olatunbosun being briefed on some of IITA’s activities. In his address, Hon. Olatunbosun said they were seeking knowledge and technical collaboration in areas key to ensuring better livelihoods and sustainability for indigenes of his constituency, Saki, through agriculture so farmers can create wealth for themselves and the nation. Areas of need he highlighted are: (1) Capacity development for farmers to improve their agricultural productivity, especially in cassava and maize, (2) Access to new varieties of cassava and maize crops, new management systems as well as new ways of agroprocessing, (3) Linkages with commercial uptakers such as Niji foods, Psaltry Farms, and other cassava processors, (4) Access to agribusiness consultants to help translate ideas into a coherent proposal. In his presentation, Dixon outlined the activities of the Cassava Weed Management Project in training farmers and spray service providers on the best use of herbicides and proper spraying methods in the past 4 years in Ago Amodu, Saki areas of Oyo North. He said several farmers’ field days have also been organized in that area. Dixon observed that the reason farmers are not getting the return on investment in view of the inputs available to them is due to poor weed control and wrong use of herbicides and improper spraying. He concluded that, in conjunction with Capacity Development Office, more training on better ways to manage weeds and plant spacing will be introduced to farmers in this region. 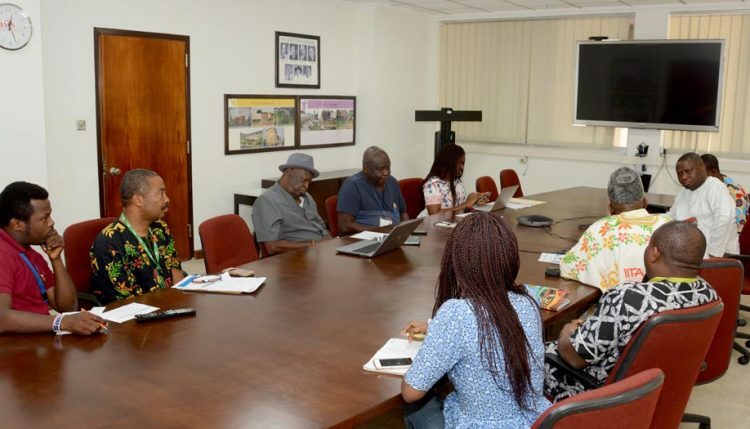 IITA maize breeder Oyewole Ajala said that the IITA Maize team has implemented projects in over 20 villages in Oyo North, especially Saki-East and Saki-West. He explained that the quality and price of local maize variety in Oyo North (N83/kilo or $0.23) is low compared to the Northern variety which sells for N95/kilo or $0.26. Ajala noted that creating the much required pull mechanism for farmers is important in aggregating grains and creating demand for increased use of production technologies. As a result of this, farmers will be encouraged to use appropriate inputs and good agronomy for better yield. He suggested that the Nigeria Incentive-Based Risk Sharing System for Agricultural Lending (NIRSAL) can be explored to finance such a grain aggregation scheme. To firm up the collaboration, a working team consisting of 5 members was formed with Ajala as the team lead. Other areas such as seed production, poultry establishment, and cultivation of maize and soybean were added to strengthen Oyo North’s agricultural program. Hon. Olatunbosun and his team were taken on a tour of the cassava semi-autotrophic hydroponics (SAH—a mass multiplication technique for cassava) multiplication center, Youth Agripreneurs’ vegetable gardens and fish ponds, and the cassava processing center. I will like to collaborate to bring this type of programe to my origin, Eruwa, Ibaarapa East Local Government. How can private people collaborate with the institute? Hello Wasiu, thank you for your comment and interest in collaborating with us. We have sent your message on to our Partnerships office. We hope to hear from them soon. Thanks.